On the second day of our Shimanami Kaidō trip we visited Ōkunoshima, also known as the ‘rabbit island’. The landlady at Sawaki was kind enough to find us a time-table for the ferry that’s departing from a port on Omishima. There was a ferry leaving at around 10 o clock and we were told that it would take around 1 hour on bicycle so we left around 8:45. We made it just in time! It was already incredibly hot outside and a blue haze shrouded all the islands in the distance. With the blue sky and the almost green water, it was very beautiful. After a short trip with the ferry we arrived at Ōkunoshima and was immediately greeted by a lot of bunnies! They didn’t seem the least bit scared as they approached us and the many children, looking for food. The children, and their parents, had come prepared and started handing out carrots and lettuce. We hadn’t prepare anything because I had heard/read that you could buy bunny food on the island. That was NOT true. Our first stop was the visitor’s centre in search of some food we could buy. With some very basic Japanese combined with English, I tried to explain that we wanted to pay for bunny food. Unfortunately my first attempt failed as they tried to explain that “we don’t eat the bunnies here”. Oh the horror! :) After making my most horrified face and explaining that “no, no, I love bunnies!”, they understood that we wanted to feed them instead of having them on the dinner table. They took us out the back and handed me a huge bouquet of bamboo for free. The man said that they didn’t really sell any rabbit food but that I could feed the bamboo to the little critters. I had a bunny like this one when I was younger! Before we went on a tour around the island we decided to visit the local museum just next door. Ōkunoshima isn’t famous only for its many rabbits but also for its poison gas factory during World War II. Most of the information is in Japanese but there are some short descriptions in English that provides visitors with the most important information. When the allied Occupation Forces disposed of the toxic gas, they also destroyed many of the buildings but the ruins still remain. Categories: Japan, Travels | Tags: Japan, Shimanami Kaidō, Ōkunoshima | Permalink. From Osaka, we continued our journey westwards to Onomichi. Onomichi is a coastal town quite close to Hiroshima and is easy to access with the Shinkansen train station being just a 10min taxi drive away from the city center. This is also the starting point for the Shimanami Kaidō, a 60km long road that takes you from Japan’s main island Honshu to the island of Shikoku while passing six smaller islands. The road is famous for its beauty and a popular destination because it’s “bicycle friendly”. We arrived at the Green Hill Hotel near the harbour in Onomichi some time after lunch. This gave us plenty of time to explore the little town built on a hillside near the sea. We picked up some tourist maps over the Shimanami Kaidō at the bicycle rental shop and a map over the Onomichi temple-walk and headed out in the heat. The streets are narrow and it wasn’t always easy to follow the instructions on the map. It wasn’t really a problem for us if we missed a temple or two since there are a lot of them. 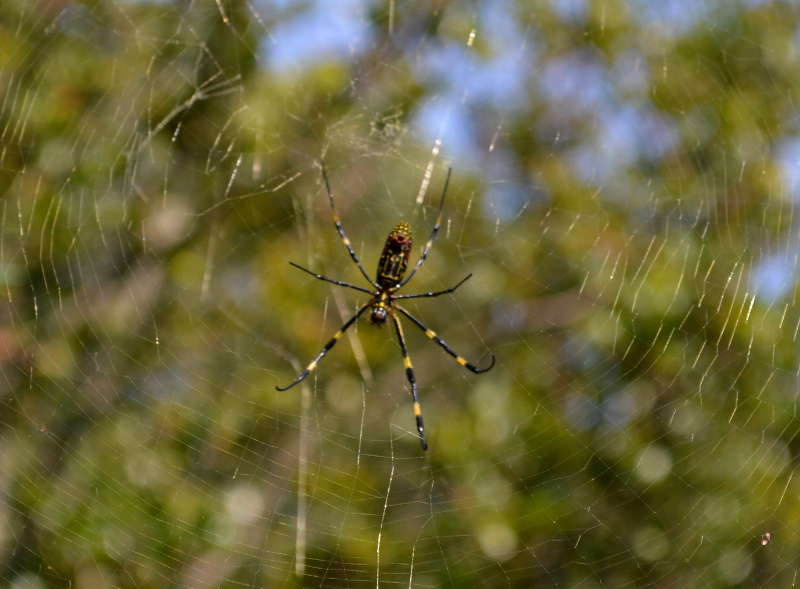 But if we really wanted to find a specific one that wouldn’t have been a problem since the locals are quite curious about, and eager to help the tourists. The temple cats in Onomichi was considerably less hostile than most cats I’ve met so far. Halfway through Onomichi we spotted a ropeway that took people to the top of the hill. Of course we had to ride it! On a clear day like this, the view was absolutely amazing. At the top of the hill, we enjoyed the local satsuma flavoured ice cream while watching the sunset. Here is our planned route with one colour for each day. On the first day (green), we planned on cycling the longest distance in order to get to Sawaki, a ryokan on Omishima. 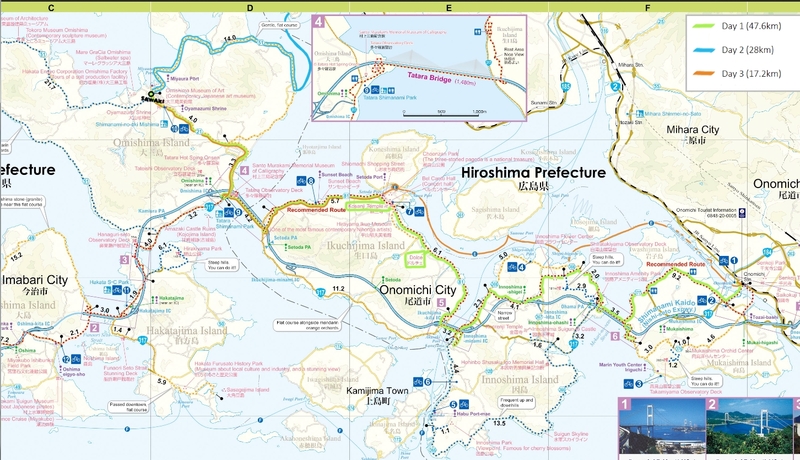 On the second day (blue), we planned to take the ferry from Omishima to Ōkunoshima (also called Rabbit Island). On the third day (orange), it was time to go back to Onomichi and just in case we were tired from all the cycling there was the possibility to take a ferry from Setoda Port. On the next day, we set out at 9 before the heat really kicked in. The recommended route was to completely ignore the first bridge and take the ferry instead. Who were we to argue with recommendations? And besides, the boat looked like the top of a pagoda and for that reason alone it was worth ignoring the bridge. 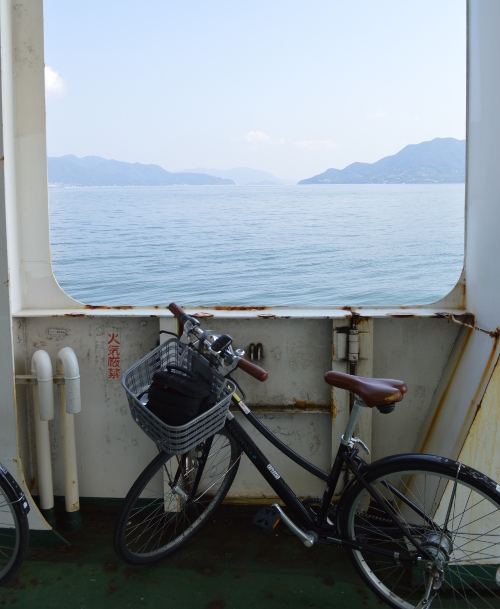 On the temple ferry, we met a nice American couple that was cycling the Shimanami Kaidō for the second time. They said we would probably love it and wished us a pleasant trip before speeding off on their racing bicycles. The Americans weren’t wrong, the road was fairly flat and the scenery lovely! The ice cream place called Dolce was well worth a visit and it wasn’t hard to find since it seemed like all the cycling tourists stopped there for a snack. Also the Kosanji Temple was a pleasant surprise. It was like no temple we’re seen before, and we’ve seen quite a few. Forget red/orange and brown wood as the only colours, entering the temple area was like walking into a colour explosion. Like many temples, this too was placed on a mountain side but the top of the mountain was like no other. Pathways of white marble lead up to the top and everywhere you looked there were beautiful sculptures made of the same marble. To complement the stone, the pathways were lined with bushes in different shades of green. The white marble, green bushes and the blue sky created an almost surreal feeling. After our visit to the temple we decided to go straight to Sawaki in order to make it to dinner time. Before we passed the bridge connecting Ikuchijima with Omishima, we stopped to admire the satsuma cultivation. The area is famous for its citrus fruits and you’ll find them growing on most hill sides. When we got to Omishima, we took route 21 to Miyaura Port. What we never suspected was how tough the 4km uphill slope would be. 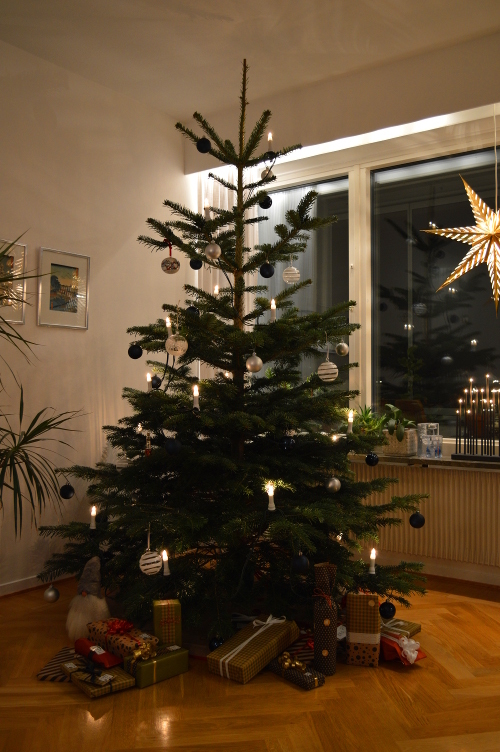 It looked like nothing when we started, but near the top I abandoned ship. After a couple of minutes rest we continued on foot. How wonderful it was to be greeted by the staff at Sawaki and have a quick soak in the onsen before they served us dinner. 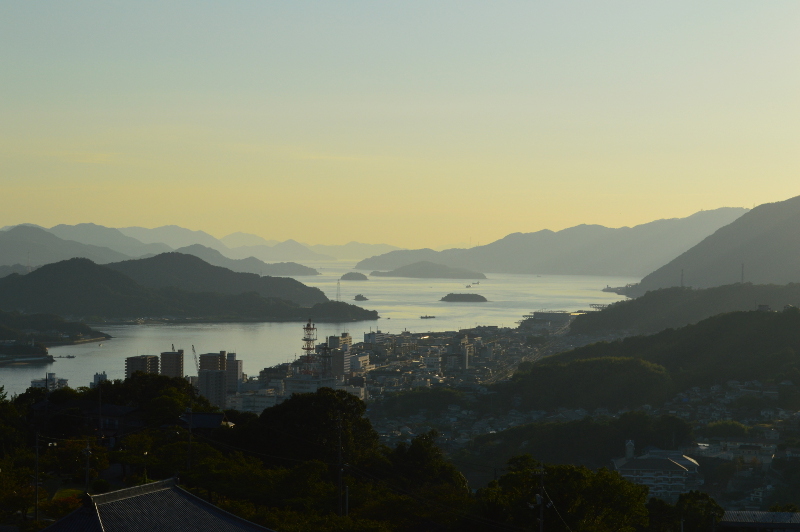 Categories: Japan, Travels | Tags: Japan, Onomichi, Shimanami Kaidō | Permalink.